Number of Sleeping Rooms/Suites: 159 Number of Meeting Rooms: 2 Total Meeting Space: 1,800 sq. ft. Indoor Session Capacity: 150 persons, 1,800 sq. ft. Outdoor Session Capacity: 120 persons, 2,400 sq. ft. Banquet Capacity: 120 persons, 1,800 sq. ft. Distance to PHX Sky Harbor: 12 miles Distance to Phoenix Mesa Gateway Airport: 22 miles Lined with palm trees, umbrellas and lounge chairs, the pool area at Chandler Southgate Hotel will quickly become your refreshing oasis. Give yourself plenty of time to enjoy our on-site amenities, from the 24-hour gift shop and fitness center to the casual restaurant and inviting courtyard. Free Internet access throughout the property and a business center make completing work while you travel easier. Guests who drive or rent a car love the free parking, but we also offer a complimentary shuttle within a five-mile radius for easy trips around town. 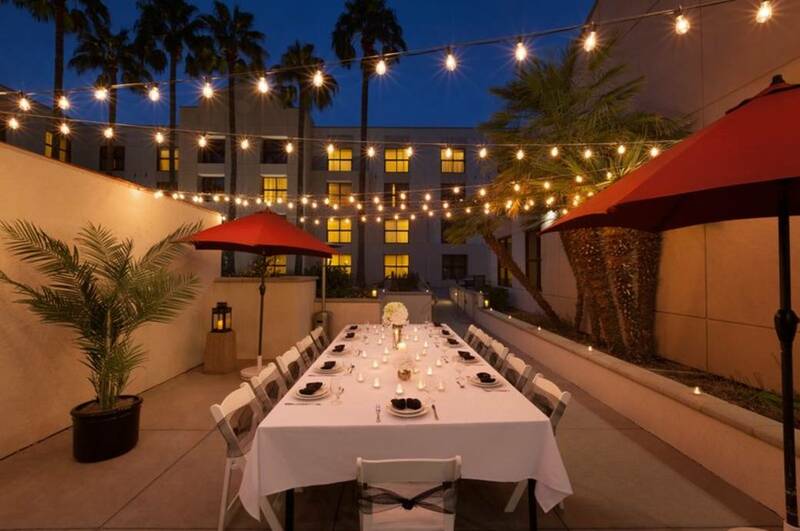 Description Chandler Southgate Hotel is located right off the I-10, just south of Phoenix and offers guestrooms with free wired and wireless internet access as well as other amenities that will make guests feel right at home. Our property also features 2,500-sq.ft. of flexible indoor/outdoor meeting space to accommodate groups from 10 to 150 guests. After a long day guests can unwind in the lounge with a beverage or relax on the spacious courtyard that features a solar-heated pool and hot tub. Hold a successful gathering of up to 150 guests by reserving the flexible indoor and outdoor event facilities at Chandler Southgate Hotel. You can plan a meeting in the Executive Boardroom with high speed internet or host a large social gathering with customized catering in the Grand Salon.